Rental Agreement: By submitting payment for this reservation, you agree that you have read, understood and agree to adhere to and be bound by the terms and conditions of this agreement, thus making it a legal binding contract. Please email [email protected] immediately if you have any questions or concerns. For purposes of this agreement: (i) references to “you,” “your” and “guest” means the individual submitting payment and all occupants of the property during the stay; (ii) references to “we,” “us,” “our,” “Manager,” and “30a Escapes” means 30AEscapes.com, LLC, (iii) references to “Owner” means the owner(s) of the rental property; and (iv) references to the “property,” “accommodation” or the “unit” means the property rented by the guest. 1. Check-In / Check-Out Times. Check-in begins at 4:00 PM (Central Time), and we will use our best efforts to have the Property ready for you at such time. In rare instances, check-in to the Property may be unavoidably delayed due to unexpected maintenance and/or housekeeping issues. You are not allowed to enter the Property until all housekeeping and inspections have been completed, and housekeepers are not authorized to grant access to the Property. Check-out time is 9:00AM (Central Time). Refunds are not given for late arrivals or early departures. Advance Payment. An advance payment equal to 50% of the total booking charges are due at the time of reservation if booked through the 30a Escapes website. This advance payment will be applied towards the total booking charges due. If the reservation is booked through VRBO or Home Away (Book Now), 100% of the total booking charges are due at the time of booking. Specials and promotional offers may be offered by 30a Escapes from time to time. All specials and promotional offers apply to new bookings only, not to existing reservations, and are available for a limited period of time. 3. Rent Payment. The balance of the total booking charges are due 60 days prior to your arrival date and will be charged to the credit card on file unless other arrangements have been made. Failure to pay the balance of the total booking charges in full when due shall result in cancellation of the reservation. If the reservation was booked through VRBO or Home Away (Book Now), 100% of the total booking charges are due at the time of booking. 4. Cancellations and Changes. Reservations may be cancelled by either party “ you” or “30a Escapes” by notifying either party in writing at least sixty (60) calendar days prior to your Check-In date (“Cancellation Period”). * In such instances, the full amount of your advance payment will be refunded less all administrative fees and charges. If you cancel a stay or a portion of a stay after the Cancellation Period, you will be responsible for the full amount of the total booking charges with no refund. No discount to the total booking charges or any refunds will be given for any adjustments or changes to your reservation after the Cancellation Period for any reason, including late arrivals, early departures, inclement weather, maintenance and/or housekeeping issues, failure, outages or noise. 30a Escapes reserves the right to correct or adjust rates to the published rates on a reservation if the rates have been misquoted due to human and/or computer error. 5. Accommodation Selections. Manager will reserve the specific unit selected at the time of your reservation upon the receipt of your advance payment and the confirmed agreement to our terms and conditions of the rental agreement. Subject to the availability for maintenance, owner usage, or other issues that may render the accommodations unsuitable for rental, and/or subject to the property remaining as a 30a Escapes accommodation at the time of stay, the guest will be placed into the specific unit as per the agreement. If the specific unit is not available, 30a Escapes will provide the guest with a full refund or the option to stay in another comparable accommodation, if available, with such alternative accommodation being within 30a Escapes’ sole discretion. The Property is individually owned and furnished to the home owner’s taste and preferences, and inventories and furnishings are subject to change without notice. You are not allowed to relocate to another property or entitled to a refund or adjustment simply because the Property does not meet your preferences or expectations upon arrival. 6. Pet Policy. Pets are not permitted in most 30a Escapes properties. Guests who violate this policy by bringing a pet to a non-pet friendly property will be charged an additional $2000, plus the expense of any cleaning deemed necessary by 30a Escapes in its sole discretion. Violations will also result in immediate eviction and forfeiture of rent. Notwithstanding this provision, 30a Escapes is committed to providing reasonable accommodation to protect the rights of guests with disabilities to bring a “service animal” (as defined by Florida and federal law) under the terms of The Fair Housing Amendments Act of 1988, Section 504 of the Rehabilitation Act of 1973, and Title II of the Americans with Disabilities Act. If a guest needs a service animal who has been trained to do work or perform tasks for a disability, he or she should request a reasonable accommodation, in writing, from 30a Escapes at the time of their reservation. The request should state that the guest has a disability and provide the specific work or task that the service animal has been trained to perform. Guests need not disclose the details of their disability nor provide a detailed medical history. Guests will be responsible for any damages caused by a service animal, including any additional cleaning fees required at the end of the stay to prepare the Property for incoming guests. Emotional support animals are only permitted in 30a Escapes properties that permit pets. 7. No Smoking. Smoking is not permitted in any 30a Escapes property. Guests who violate this policy will be charged an additional $2000, plus the expense of any cleaning deemed necessary by 30a Escapes in its sole discretion. Violations will also result in immediate eviction and forfeiture of all booking charges. 8. Maximum Occupancy; Events. The maximum number of guests per accommodation is based on the individual accommodation’s ability to comfortably and safely house our guests. If the maximum occupancy is exceeded, you may be subject to immediate eviction and forfeiture of all booking charges. Guests shall not have parties or events at the home without obtaining prior approval of 30a Escapes and payment of additional fees. Some properties and/or communities do not allow events of any kind, and all approvals shall be in 30a Escapes’ sole discretion. 9. Age Requirements. 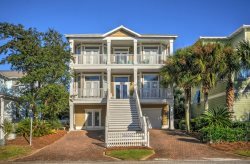 All 30a Escapes accommodations are family rentals. No units will be rented to vacationing students or young adults under the age of 25 unaccompanied by a responsible parent or guardian at a ratio of five (5) young adults to one (1) adult over the age of 25. The person on the reservation must be staying in the unit at all times. Guests who violate this policy will be immediately evicted and forfeit all booking charges. 11. Falsified Reservations. Reservations made under false pretense are null and void and check-in will not be allowed or guests will be asked to vacate the accommodations. This policy includes reservations made by parents or guardians who do not check in, and/or who leave overnight during the length of the stay. Any reservation obtained under false pretense will forfeit total booking charges. 1 Multi-Party Occupancy. If two or more parties reserve or occupy a single property, and one or more of the parties cancel, the primary guest whose name appears on the reservation is financially responsible for all booking charges associated with the reservation. In addition, each party, jointly and severally, is required to be in compliance with all of these terms and conditions and will be liable for any and all damages which may be caused during a stay. 13. Entry by 30a Escapes. 30a Escapes or its agents may enter the property in case of an emergency, to make any repairs, alterations or improvements, to supply services, to show the property to prospective purchasers, renters or contractors, or upon reasonable suspicion that guest has breached any of its obligations hereunder. We will try to provide at least 3 hours notice of intent to enter the property except in the case of an emergency, provided, that failure to provide advance notice of intent to enter the property shall not affect our ability to enter for the reasons set forth above. 14. Housekeeping. Your vacation accommodations will be cleaned to our quality standards prior to your arrival and after your departure. You will be responsible for the cleaning of your unit during your stay and for leaving the unit in good condition at check-out. We respectfully request that you remember that you are staying in someone’s home during your vacation; please treat it with the care you would your own. If units are found abnormally dirty at check-out, additional charges will be charged to your credit card on file to assist in performing a deep cleaning of the unit. All stays will be subject to a cleaning fee. Additional cleanings can be arranged during your stay for an additional fee. 15. Beach & Pool Towels. Please bring your own beach and/or pool towels as we do not permit bath towels or linens to be taken from the unit. 16. Amenities. 30a Escapes provides the property with a complimentary set of amenities including 2 rolls of paper towels per kitchen sink, 2 dishwasher tablets per property, 2 kitchen trash bags, 1 small sample size of dishwashing liquid, 1 hand soap per bathroom sink, 2 rolls of toilet paper per bathroom, and 1 small sample of each of the following per full bathroom: shampoo, conditioner, body lotion, body wash and facial soap. You are responsible for the purchase of any additional items you may require during your stay. 17. Maintenance. During your stay, promptly report any maintenance problems to the Manager. No refund or rate adjustment will be made for maintenance failures, including any disruptions or failures related to the supply of electricity, water, pool systems, air conditioning, telephone, television or cable service, appliances, wi-fi, etc., regardless of whether such issues were reported to the Manager. 18. Propane Tanks. Should a propane tank for a grill become empty during a guest’s stay during regular business hours (9 AM- 5 PM CST), we will come exchange it. If it is reported empty after hours, this is a non-emergency item and will be replaced within 24 hours. At any time during business hours or after hours, the guest has the option to exchange the tank themselves at their own risk. If the original receipt is provided to the Manager, we will reimburse the guest for the exchanged propane tank. Reimbursement will be made to the credit card on file for the reservation only. 30a Escapes is not liable for loss of food products due to propane running out during cooking. 19. Damage Policy. Guests are responsible for the property, its contents, and themselves during occupancy. Guests must lock windows and doors securely when not in the premises. Rearranging the furniture or removing any items from the unit is prohibited. After Check-Out, the Manager will inspect the unit for damage, rearranged furniture, missing items, and abnormally dirty appearance. If the Manager determines that damage has occurred, items are missing, or the unit is abnormally dirty, the Manager will repair the damage, replace the missing items, and/or perform a deep clean of the unit at your expense. You authorize Manager to charge the credit card on file to reimburse the Manager for any such expenses. 20. Hurricanes and Severe Weather. Refunds for cancellations or shortened stays due to actual or anticipated hurricanes, tropical storms, other inclement weather or Acts of God will not be issued by Manager under any circumstances. We recommend all guests purchase travel protection insurance from a 3rd party company, as 30a Escapes does not offer travel protection. 21. Nearby Construction. There may be construction ongoing at properties adjacent to or close by the property being rented by guest. The rules regarding acceptable noise levels, start and finishing times, and other restrictions relating to any such construction are governed by local ordinances and/or community specific rules and regulations beyond the control of the Manager. The Manager will use its best efforts to ensure that the appropriate parties are notified and appropriate remedial action taken in the event that it receives notice that the construction at issue may be in violation of any such regulations or ordinances. 22. Interference with Stay. We are not liable for any disturbance or interruption that may occur during your stay that is outside of our reasonable control, including noises, disturbances or facility closures, whether due to construction, neighbors, events or other circumstances beyond our reasonable control. As such, guest shall not be entitled to a refund relating to any such disturbances or interference nor to be moved to another property. Security of Personal Property. The Manager is not responsible for any acts of theft or vandalism, or other damages to any personal property or for personal items left by guest in the accommodation at departure. 24. Payment Method. Please provide payment directly with one of our property managers over the phone or via the online payment system if making a booking online. Payment must be via credit card. The final payment will be automatically charged sixty (60) days prior to your arrival using the same credit card you used to process the booking deposit. 25. Card on File. Guests give 30a Escapes permission to charge the credit card on file for anything over the policy limit or not covered by the damage waiver. Anything over and above the guests’ credit card limit will be turned over to our attorney. Any legal costs and fees are stipulated below. There will be no additional charges provided the following provisions are met: (i) No damage is done to the property or its contents, beyond normal wear and tear; (ii) Guest did not incur any charges due to contraband, pets, or collection of rents or services rendered during the stay; (iii) No excessive cleaning is required; (iv) All keys and pool/beach passes are left in the designated location; (v) The unit is left locked; and (vi) No linens are lost or damaged. 26. No Subletting. The rental property may not be sublet. Your reservation is not transferable to any other party. 27. Property for Sale. In the event a property is on the real estate market, 30a Escapes may need to show the property during your stay. 30a Escapes will make every effort to provide the guests occupying the property 24 hours’ notice before scheduling any showings. 28. Compliance with Laws, Rules and Regulations. Guest shall abide by and observe all applicable federal, state and local laws during their stay, as well as any rules and regulations governing the use of the property and neighborhood you are occupying. These rules apply to both owners and guests, and failure to comply will result in eviction and forfeit of all booking charges. If you or other occupants (i) fail to strictly abide by the laws of the United States, the state of Florida, local laws and/or neighborhood rules and regulations, or otherwise fail to strictly abide by the terms of this agreement, (ii) cause damage to the property or any surrounding area, or (iii) engage in any other act(s) which interfere with others’ rights to quiet enjoyment of their premises, guest shall be subject to immediate eviction from the property without any refund of BOOKING CHARGES and liability for additional charges for damages incurred. All such decisions shall be in the sole discretion of 30a Escapes. 29. Refundable Damage Deposit. On certain properties, such as all Ultimate Beach House properties, 95 Chivas and 46 Cartagena, a refundable damage deposit is required in lieu of the Damage Waiver Fee. This is refundable approximately 2 weeks after departure as soon as the property and linens have been inspected for damage and cleanliness. The deposit will be refunded to the guest credit card on file, less any costs, for excessive cleaning, damaged linens, broken or missing household items, décor, etc. 30. Indemnification of Manager. You and all occupants shall, jointly and severally, defend, indemnify and hold 30a Escapes.com, LLC (including its members, officers, employees, subcontractors, agents and representatives) and the Owner (the “Manager Parties”), harmless from any and all claims, liabilities, losses, costs and expenses (including, but not limited to, reasonable attorneys’ fees and costs of suit) incurred the Manager Parties related to, as a result of or arising from the actions of the guest and any occupants, including any negligent acts or omissions, willful misconduct, violations of laws or any obligations in this agreement, except to the extent such claims, demands and actions arise from the gross negligence or willful misconduct of the Manager Parties. 31. Limitation of Liability. you understand and agree that NO MANAGER PARTY ASSUmes any liability for loss, damage, claim or injury to persons or their personal property while on the Premises, nor for any inconvenience, damage, claim, loss or injury arising from or related to any temporary defects or stoppage in supply of water, gas, cable service, electricity, internet service or plumbing; changes to rental assignments; website or brochure errors; weather conditions; natural disasters; acts of God; or other reasons beyond their control. 32. Release of the Manager Parties. In addition to the other specific releases set forth in this agreement and its addendum, you, for yourself, your heirs, assignors, executors, and administrators, and on behalf of each occupant of the property, and such occupants’ heirs, assignors, executors and administrators, fully release and discharge the Manager Parties from any and all liabilities, claims, demands, and causes of action which you, any occupant or their family members have or may have in the future by reason of any injury, loss or damage by whatever nature which has or have occurred, or may occur to you, or to any of the occupants during the stay as a result, or in connection with the occupancy of the property or in use of any item provided during your stay, including bikes, golf carts or other recreational items, including any claims, damages, costs or causes of action due to the negligence, breach of contract or wrongful conduct of any Manager Party, and agree not to sue and to hold the Manager Parties free and harmless of any claim or suit arising there from. The undersigned understands, intends and desires to release the manager parties from any and all liability arising from or related to the occupancy of the PrOPERTY to the fullest extent permitted by the laws of the State of Florida. 33. Golf Cart. Guests who rent units that provide complementary golf carts further agree to the express terms, conditions and waivers set forth in the attached Golf Cart Waiver and Damage Addendum. In consideration for receiving access and/or permission to use any bikes at your rental property or otherwise made available to you as an amenity in conjunction with your rental by 30a Escapes and the Owner, you hereby RELEASE, WAIVE, DISCHARGE, AND COVENANT NOT TO SUE, AND AGREE TO INDEMNIFY AND HOLD HARMLESS for any and all purposes the Manager Parties FROM ANY AND ALL LIABILITIES, RESPONSIBILITIES, CLAIMS, DEMANDS, CAUSES OF ACTION OR INJURY, INCLUDING DEATH, that may be sustained by you or your guests or invitees while using the bikes, whether caused by the Manager Parties’ active or passive negligence. You agree that you are fully aware that there are inherent risks involved with the use of bicycles, including but not limited to possible physical injury (including, but not limited to broken bones, strains, sprains, bruises, concussions, heart attack, heat exhaustion) and loss of life and you choose to voluntarily use the bicycles with full knowledge that the use of the bicycles may be hazardous to you, your guests, your invitees, and your property (“You”). YOU VOLUNTARILY ASSUME FULL RESPONSIBILITY FOR ANY RISKS OF LOSS, PROPERTY DAMAGE OR PERSONAL OR EMOTIONAL INJURY, INCLUDING DEATH, that may be sustained by You as a result of using the bicycles, whether supervised or unsupervised. In consideration for receiving access and/or permission to use any swimming pool, spa or hot tub (collectively referred to herein as “Pool Facilities”) at your rental property or otherwise made available to you as an amenity in conjunction with your rental by 30a Escapes and the Owner, you hereby RELEASE, WAIVE, DISCHARGE, AND COVENANT NOT TO SUE, AND AGREE TO INDEMNIFY AND HOLD HARMLESS for any and all purposes the Manager Parties FROM ANY AND ALL LIABILITIES, RESPONSIBILITIES, CLAIMS, DEMANDS, CAUSES OF ACTION OR INJURY, INCLUDING DEATH, that may be sustained by you or your guests or invitees related to, involving or arising from you or your guests use of the Pool Facilities or other actions or omissions related thereto, whether caused by the Manager Parties’ active or passive negligence. You agree that you are fully aware that there are inherent risks involved with Pool Facilities, including but not limited to possible physical injury (including, but not limited to broken bones, strains, sprains, bruises, concussions, heart attack, heat exhaustion) and loss of life (drowning) and you choose to voluntarily use the Pool Facilities with full knowledge that the use of the Pool Facilities may be hazardous to you, your guests, your invitees, and your property (“You”). YOU VOLUNTARILY ASSUME FULL RESPONSIBILITY FOR ANY RISKS OF LOSS, PROPERTY DAMAGE OR PERSONAL OR EMOTIONAL INJURY, INCLUDING DEATH, that may be sustained by You as a result of using the Pool Facilities, whether supervised or unsupervised. You understand that the Manager Parties may not maintain any insurance policy covering any circumstance arising from your use of the Pool Facilities or any event related thereto. As such, you are aware that you should review Your personal insurance coverage. 36. Use of Personal Data and Private Information. Your privacy—and the protection of your private information, such as your email address, credit card information, physical address, and name—is important to us. We will only use your financial information (including your credit card information on file) as necessary to process payment for booking charges and other authorized fees and damages in accordance with this agreement. We will only use your other private information that we may collect to (i) fulfill, offer, or further develop (or improve) our products, services, and offers or those of our affiliates, (ii) communicate with you or our applicable employees, agents, and third-party service providers, and (iii) provide you information about new and existing products, services, and offers that may interest you related to 30a Escapes or our affiliates. Additionally, we may also collect “cookies” (small files that contain unique identifiers that allow our computers to identify your web browser, though not you specifically, each time you visit our website) and anonymous information about you, such as how long you stayed on the website, the name of your internet service provider, and the portions of our website you viewed. Any cookies or anonymous information we collect will only be used to improve functionality of our website, or for research and analytical purposes (though no personal information about you will be included for research and analytical purposes). Your personal information will not be shared or sold to third parties for the purpose of their telemarketing or selling their products or services, unless you otherwise consent to such disclosure or sale. While utilizing our website, or any internet access made available during your stay at one of our locations, you agree not to engage in any activity that violates any federal or state privacy, copyright, or criminal law, or that could be considered malicious or unethical. If you become aware of such activity by yourself, or by another, you must immediately notify us. Likewise, you agree not to share or disclose any password created by you, or made available to you, related to internet access or our website. Despite our continual and evolving efforts to maintain appropriate protections, we cannot guarantee the security of your private information. Accordingly, you acknowledge and agree that we make no such guarantee. You recognize and accept that we have no control over the unauthorized interception or breach of any communications or data once it has been sent or has been subject to unauthorized access, notwithstanding all reasonable security measures employed by us or our third-party vendors. You consent to our use of these electronic devices and applications and submission of confidential client information to third-party service providers for your reservation. Similarly, our website may provide links to other websites or resources, of which we have no control over. We are not responsible for the availability of such external websites or resources, and we do not endorse and are not responsible or liable for any content, advertising, products, or other materials on or available from such websites or resources. You further acknowledge and agree that we shall not be responsible or liable, directly or indirectly, for any damage or loss caused or alleged to be caused by or in connection with use of or reliance on any such content, goods or services available on or through any such website or resource. 37. This contract is binding upon initial payment. No signatures are required. 38. Applicable Law. This Agreement shall be deemed to have been made and entered into in the State of Florida, and will in all respects be governed by, construed under, and enforced and interpreted in accordance with the laws of the State of Florida, excluding its principles of conflicts of laws. 39. Venue, Jurisdiction, and Attorneys’ Fees. The exclusive venue for any civil action related to this agreement or the course of dealings between the parties is the courts sitting in Walton County, Florida. The parties hereby submit to the personal jurisdiction of all the courts in the previous sentence and agree not to challenge such jurisdiction. In any action, suit, or proceeding to enforce or interpret the terms of the Agreement or to collect any amount due hereunder, the prevailing party shall be entitled to reimbursement for all costs and expenses reasonably incurred in enforcing, defending or interpreting its rights hereunder, including, but not limited to, all attorneys’ fees and the costs expended in determining entitlement to and amount of such fees. 40. Waiver of Jury Trial. BY ENTERING INTO THIS AGREEMENT, THE PARTIES KNOWINGLY AND VOLUNTARILY WAIVE THE RIGHT TO A JURY TRIAL AS TO ANY CLAIMS A PARTY MAY CLAIM TO HAVE AGAINST THE OTHER WHICH ARISES OUT OF THIS AGREEMENT OR THE COURSE OF DEALINGS BETWEEN THE PARTIES. 41. Force Majeure. Notwithstanding any other provision of this Agreement, no party to the Agreement shall be deemed in default or breach of this Agreement or liable for any loss or damages or for any delay or failure in performance (except for the payment of money) due to any cause beyond the reasonable control of, and without fault or negligence by such party. 42. Entire Agreement. This Agreement constitutes the entire agreement between the parties and supersedes any prior understanding, marketing or agreement among them respecting the subject matter hereof. There are no representations, arrangements, understandings or agreements, oral or written, relating to the subject matter of this Agreement, except those fully expressed herein. No waiver of any provision hereof shall be valid or binding on the parties hereto, unless such waiver is in writing and signed by or on behalf of the parties hereto, and no waiver on one occasion shall be deemed to be a waiver of the same or any other provision hereof in the future. 43. Severability. If any term or provision of this Agreement is held illegal, invalid or unenforceable, such illegality, invalidity or unenforceability shall not affect the legality, validity or enforceability of the remainder of this Agreement. 44. Binding; No Assignment. All of the terms, covenants and conditions of this agreement shall be binding upon and inure to the benefit of the parties hereto and their respective heirs, legal representatives, successors and assigns. You may not assign this agreement without our consent, and any attempted assignment shall be null and void. 45. Headings. Section and other headings contained in this Agreement are for reference purposes only and are in no way intended to define, interpret, describe or limit the scope, extent or intent of this Agreement or any provision hereof. A nonrefundable Damage Waiver Fee is required for all reservations. We require a valid Visa, Master Card, or America Express number on file in addition to the Damage Waiver Fee. The Damage Waiver Fee is a nonrefundable Fee that relieves guest of the cost for unintentional and incidental damage to the rental property and its contents, not to exceed the amount of coverage of $1500. The Damage Waiver Fee does not cover intentional damage, theft, unauthorized entry into the Owner’s supply closet, unauthorized pets, extensive cleaning required at check-out, smoking, exceeding occupancy limits or parking limits, any breach of any of the terms of the rental agreement, including any fines imposed on Manager by the city, county, state or homeowners or condominium association as the result of violation of any law, ordinance, rule or regulation or any fines or costs levied against guest or visitors of guest (Excess Damage Costs). Guest will be notified of any Excess Damage Costs in writing. Any Excess Damage Costs will also be charged immediately to guest’s credit card. Guest assumes full responsibility for any items found to be missing and any damage due to misuse, negligence or action on guest’s or guest’s visitor’s part, except in the case of normal wear-and-tear reported to Manager within 48 hours of Check-in. The Damage Waiver Fee does not substitute for guest’s responsibility to leave the property in appropriate condition. The Damage Waiver Fee does not negate guest’s responsibilities as a responsible renter, nor does it relieve guest from responsibility for intentionally destructive acts of guest or other members of guest’s party while in occupancy. Guest must notify Manager of any damage or theft to the unit during guest’s occupancy or upon vacating. The property will be carefully inspected after guest’s departure and any damage, theft or other incidents which occur during guest’s occupancy and which have not been disclosed to Manager prior to guest’s leaving will remain guest’s obligation. The maximum aggregate amount of accidental damage that is covered by the Damage Waiver Fee is listed in your rental agreement. Any damage in excess of this amount remains the responsibility of guest. All waivers of theft or damage will be administered by Manager at the property. Manager will have the sole authority to determine the nature and extent of damages, necessary repairs and eligibility for the waiver of liability described herein. Guest must report any theft or damage to the property or its contents prior to checkout or any otherwise applicable damage waiver will be void. TERM OF COVERAGE: The waiver takes effect upon check-in on the booked arrival date to the property, together with receipt of payment of the waiver fee, at or before check-in. All coverage shall terminate upon normal check-out time of the property or the departure of the guest, whichever occurs first. • Intentional acts of a guest. • Damage caused by any pet brought onto the property by guest. • Property damage resulting from motorized vehicles or watercraft operated by guest. • Any cause whatsoever if the guest does not report the damage to Manager prior to check out.